I woke up this morning to find this on my printer. I really like how it came out with fuzzy skin enabled. Aside from the two spots where the supports were connected at the very top and the very bottom, you can barely tell it was 3D printed. Although, the model I downloaded is a bit too small where it connects to the gun. I'll need to file it down a bit to get it on. This thing took nearly sixteen hours to print at 100% infill. It was an interesting project but it took forever to complete. Nice, that looks awesome!! And wow, 100% infill? I bet it feels rock solid. It does feel pretty solid yet surprisingly light. However, the handle itself is hollow to allow access to the screw hole to attach it to the gun. You can see what I mean in Thingview. I'd be more confident in this one. 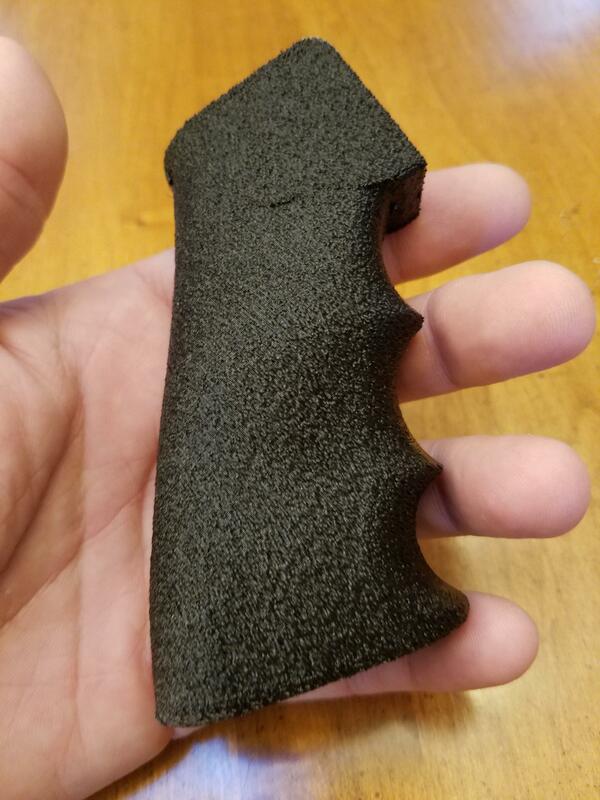 I printed a skeletal version and installed it on a stock class phantom due to weight concerns. It plays nice, but this one seems like it could take much more abuse than mine. Nice print, I dig the texture. First iteration for test fit, crazy low resolution. A few modifications to be made to get it to fit right, but it functions! Looking good! What kind of spring are you using in this video? Honestly I'm not sure, it came in an assorted spring pack from Home Depot. I'll have to check the dimensions. I pulled off my first commissioned batch of Phantom dropout valve feed caps this morning. I'm doing some light sanding now inside for fit & finish then they're off to Canada. I got back from EMR this weekend and I whipped up a replacement part for one of my Helix mags. I lost the part of the follower that holds it onto the spring. It was a simple job in Fusion 360 to recreate it. A few minutes later, it was off the printer and inside my magazine working great. I can barely tell which magazine is the repaired one. The model does not need to be reoriented.